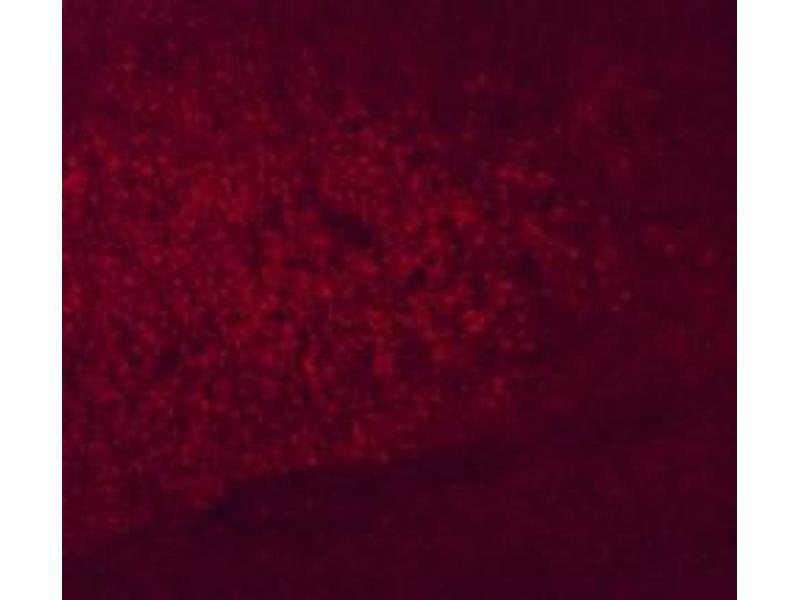 Anti-Six3 Antibody - Immunofluorescence Microscopy Immunofluorescence microscopy using anti-Six3 antibody shows detection of Six3 in PFA-fixed embryonic mouse hypothalamus. Primary antibody was used at 1:250 dilution. Personal Communication, Miriam Dillard, St. Jude Children's Research Hospital, Memphis, TN. Anti-Six3 Antibody - Immunofluorescence Microscopy Immunofluorescence microscopy using Anti-Six3 antibody shows detection of Six3 in PFA-fixed embryonic mouse prethalamus. Primary antibody was used at 1:250 dilution. Personal Communication, Miriam Dillard, St. Jude Children's Research Hospital, Memphis, TN. 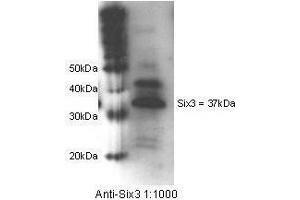 Anti-Six3 Antibody - Western Blot. 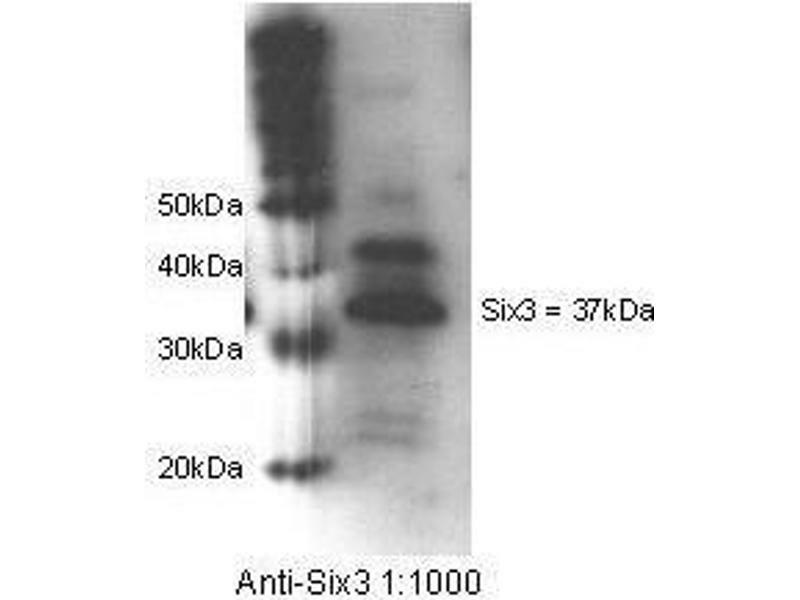 Western blot using Protein A purified anti-Six3 antibody shows detection of Six3 in whole cell lysate. The band marked corresponds to Six3 at an approximate molecular weight of 37Kda. 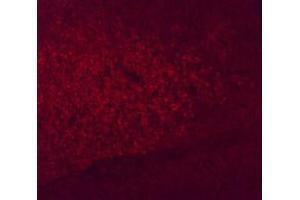 The primary antibody was used at a 1:1000 dilution. Personal Communication, N. Johnson, St Jude Children's Research Hospital, Memphis, TN. Purification This product was purified by Protein A chromatography from monospecific antiserum. This antibody reacts with mouse Six3. Expect partial reactivity with Six3 from chicken and Xenopus sources based on 95% and 85% homologies, respectively. Cross-reactivity with Six3 from other sources has not been determined. 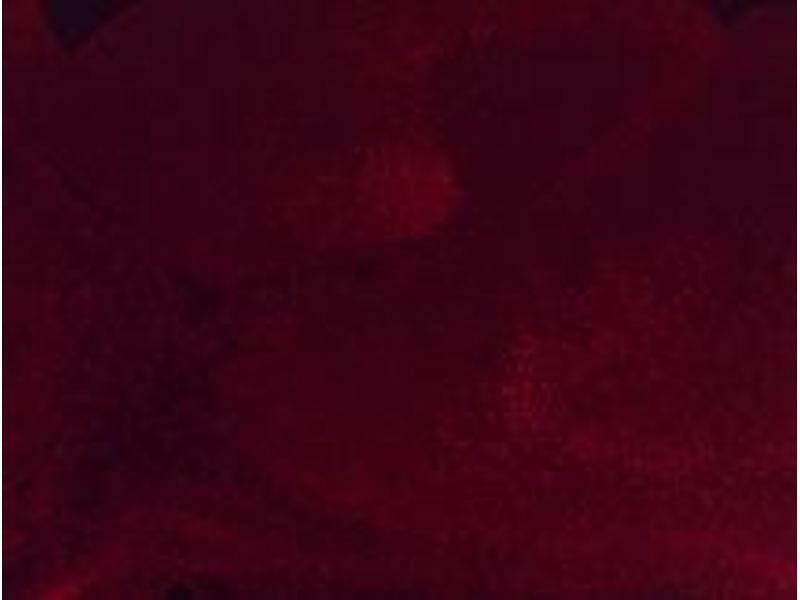 Immunogen: This Protein A purified antibody was prepared from whole guinea pig serum produced by repeated immunizations with a synthetic peptide corresponding to an internal region of mouse Six3 protein. Background: Six3 (also known as sine oculis homeobox homolog 3) is involved in the development of the visual system and forebrain. Six3 is a nuclear protein that is reported to exist in two forms by alternative splicing of the gene product. Six3 is first expressed at E6.5 of mouse embryonic development around the anterior border. At E8.5, expression is found over the anterior neural plate. At E9.5, it is in the diencephalic part of the ventral forebrain, optic vesicles, olfactory placodes and Rathke's pouch. In later stages, Six3 is present in hypothalamus, eyes and pituitary. 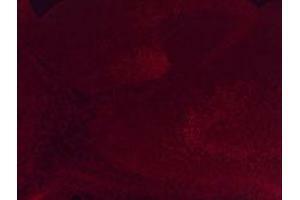 Application Note: This Protein A purified antibody has been tested for use in ELISA, immunofluorescence microscopy and western blotting. Specific conditions for reactivity should be optimized by the end user. Expect a band approximately 37 kDa in size corresponding to Six3 by western blotting in the appropriate cell lysate or extract. Stockage commentaire Store vial at -20° C or below prior to opening. This vial contains a relatively low volume of reagent (25 μL). To minimize loss of volume dilute 1:10 by adding 225 μL of the buffer stated above directly to the vial. Recap, mix thoroughly and briefly centrifuge to collect the volume at the bottom of the vial. Use this intermediate dilution when calculating final dilutions as recommended below. Store the vial at -20°C or below after dilution. Avoid cycles of freezing and thawing.